Elizabeth Alexandra Mary, 1926–. Queen of the United Kingdom of Great Britain and Northern Ireland, 1952–. Superb Document Signed, Elizabeth R, one page, 8" x 13", with blind embossed seal, given at the Court of St. James's, December 1, 1952. 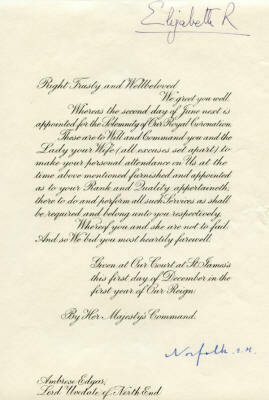 Countersigned by the Earl Marshal, the Duke of Norfolk, 1908-1975, Norfolk E. M. With original mailing envelope. 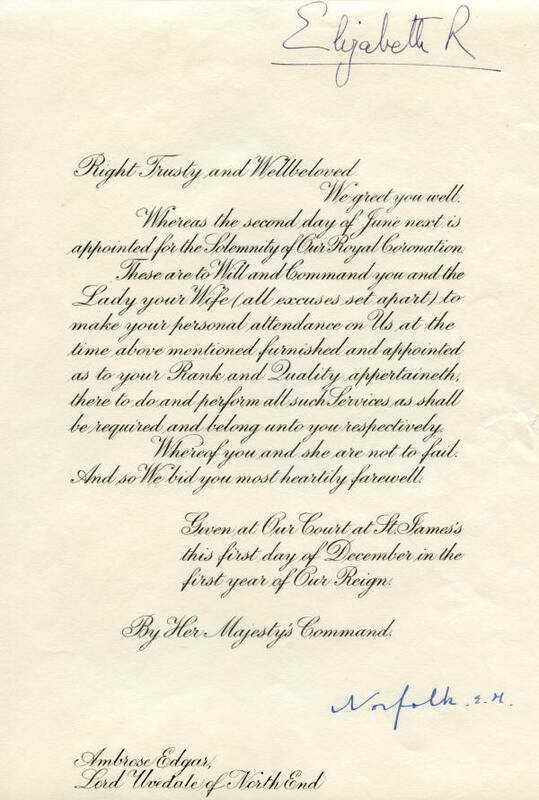 This is a rare summons in which the 26-year-old Queen Elizabeth II commands Sir Ambrose Edgar Woodall, Lord Uvedale of North End, and his wife to attend her coronation the following June. The summons reads: “Right Trusty and Wellbeloved / We greet you well. / Whereas the second day of June next is appointed for the Solemnity of Our Royal Coronation. / These are to Will and Command you and the Lady your Wife (all excuses set apart) to make your personal attendance on Us at the time above mentioned furnished and appointed as to your Rank and Quality appertaineth, there to do and perform all such Services as shall be required and belong unto you respectively. / Whereof you and she are not to fail. And so We bid you most heartily farewell." The Queen, the first daughter of King George VI and Queen Elizabeth, was born April 21, 1926, when her parents were the Duke and Duchess of York. Her father acceded to the throne when his brother, King Edward VIII, abdicated in 1936. Thereupon Elizabeth became the heir presumptive to the throne. In 1947, she married Lt. Philip Mountbatten, now Prince Philip, the Duke of Edinburgh. She acceded to the throne when King George VI died on February 6, 1952. Her coronation was some 16 months later, on June 2, 1953, at Westminster Abbey in London. Woodall (1885-1974) was created Baron Uvedale of North End on June 26, 1946. He was a prominent British surgeon who served as Resident Surgeon at Manor House Hospital from 1921 to 1958 and as Medical Advisor to the National Union of Railway Men and other unions from 1922 to 1958. This title in the Peerage of the United Kingdom came from North End in the county of Middlesex. Woodall, a knight, sat as Lord Uvedale in the House of Lords. Because he had no children, the peerage became extinct upon his death on February 28, 1974. Our research has found only three similar documents that have sold at auction, and only two of those were described as genuinely signed by The Queen. Queen Elizabeth has signed this summons with a large blue fountain pen signature at the upper right. The Earl Marshal, Bernard Fitzalan-Howard, the 16th Duke of Norfolk, who organized the coronations of both King George VI and Queen Elizabeth II and later also the investiture of Prince Charles as Prince of Wales, has countersigned it in bright blue at the lower right. This is a beautiful document. It has never been folded, but instead was mailed flat. It is accompanied by the original mailing envelope containing the cardboard stiffener and the tissue paper overlay used to protect the document. It is in very fine to extra fine condition.  The accompanying envelope is soiled and has some stray fountain pen marks, but it is in fine condition overall.